Maneuver Node Evolved adds several features to the stock maneuver node that are meant to make life a little easier. There are four separate components of the addon, each affecting different areas of maneuver node interaction. The in-game settings menu can be used to adjust and/or disable these functions. From the start, when you click on the orbit path to create a new maneuver node, this will automatically scan the region around where you clicked, identifying any areas of interest and adding those to the popup as new buttons to create the maneuver node. Possible points of interest to snap the maneuver node to are: Apoapsis, Periapsis, Equatorial Ascending and Descending Nodes (disabled at extremely low inclination orbits), Target Relative Ascending and Descending Nodes, and Target Closest Approach Points. The amount of tolerance for how far away one of these points can be from the point you selected on the orbit path can be adjusted in the settings menu (the Eq. nodes have a slightly higher tolerance because there is no corresponding map node). Next, when you want to open a maneuver node a simple keyboard shortcut is provided. By default, press N while holding the modifier key (Alt on Windows) to open or close a maneuver node (the shortcut key can only be adjusted in the settings file on disk, found at GameData/ManeuverNodeEvolved/PluginData/Settings.cfg). The maneuver node to be activated is selected by, in descending order of preference, the currently focused maneuver node (press Tab when focused on the current vessel to cycle through focus for all maneuver nodes), the last activated maneuver node, or the first node. 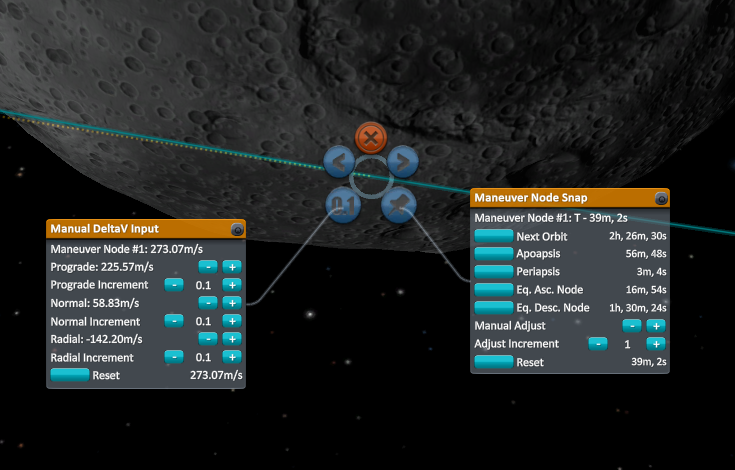 Pressing the shortcut again will close that maneuver node’s gizmo (the DeltaV handles, or circle with buttons). And when you want to adjust a maneuver node there are several options available to modify their UI scale. The baseline scale can be adjusted from 0.5 X - 2.5 X the normal size, and a dynamic scaling option can be enabled with the max scale set to 1.5 X - 5 X the normal size. 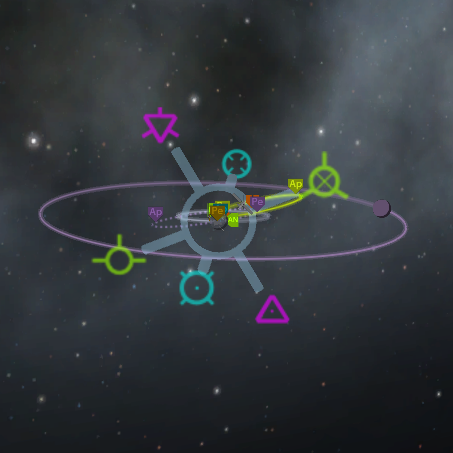 The dynamic scale increases the size of the maneuver node gizmo (the unopened flower/star-like symbol size is not changed) based on the camera’s distance to the node. It reaches the max scale at about 2-3 X the distance of Minmus from Kerbin. There is an additional option available when the “Rotate Gizmo With Orbit” option is enabled, “Alignment Accuracy”. This allows for a tradeoff to be made for performance over accuracy in the calculation of the appropriate adjustments needed to the DeltaV. In general, this should not need to be changed, but if you notice any slowness, or stuttering when the maneuver gizmo handles are pulled all of the way, or when adding large increments to the DeltaV, you can lower this setting to 1 or 0. Maneuver Node Evolved uses a simple, geometry-based method to correct the DeltaV adjustment. The only problem is that orientation of the post-maneuver orbit must always be updated before changing the DeltaV. When the DeltaV is changed in relatively large increments (pulling all the way on a handle makes a 20m/s change per tick) the orbit orientation changes so much that error are introduced. A simple solution is to break up large changes into incremental updates, fixing the orbit orientation between each update. At the highest accuracy setting, any change of greater than 1m/s will be broken up into multiple updates. This means that the orbit orientation changes very little between updates and the error are minimal. This can be a bit processor-intensive with large updates to the DeltaV, so some people may need to decrease this settings, allowing for either 2 or 4m/s increments; the error at these levels is still relatively small. Finally, when you right-click on the maneuver gizmo to bring up the little circle with the Close, and Orbit +/- buttons, there will be two new buttons in place of those +/- buttons. These open a manual DeltaV input window, and a maneuver node movement window. These windows are designed to look like the part context windows (they aren’t actually the same), right down to the connecting lines and the window-lock toggles. The manual DeltaV input window allows you to make fine-grained changes to each of the DeltaV components. Adjust the increment for each component with the +/- buttons; from 0.01 - 100m/s. When the post-maneuver node orientation option is on, the values added will be corrected for that orientation, meaning that the DeltaV values shown for each component will not be changed by the increment value for that component, but instead by the corrected value for the new orbit orientation. There is also a button to reset the DeltaV to its value when you first opened the window. The maneuver node snap window allows you to move the node to any of the orbital positions described above, in the first section. It also has +/- orbit buttons, which serve the same purpose as the stock buttons, and Next and Previous Patch buttons. When you place a maneuver node on an orbit that either escapes an SOI or encounters another SOI these buttons will allow you to move the maneuver node to the next orbit section. So, if you are in Kerbin orbit, and have an encounter with the Mun, you can place the maneuver node somewhere in Kerbin orbit, the Next Patch button will then shift the maneuver node to the halfway point for the Mun section of that orbit. The options shown in this panel match what is actually available given the current orbit properties, so you won’t be able to set the maneuver node to the Apoapsis when on an escape trajectory, or to the Next Orbit when on a flyby trajectory. Both of these windows have the same toggle buttons in the top-right corner as the standard part context windows. When selected, these allow the windows to stay open when another maneuver node is focused on. 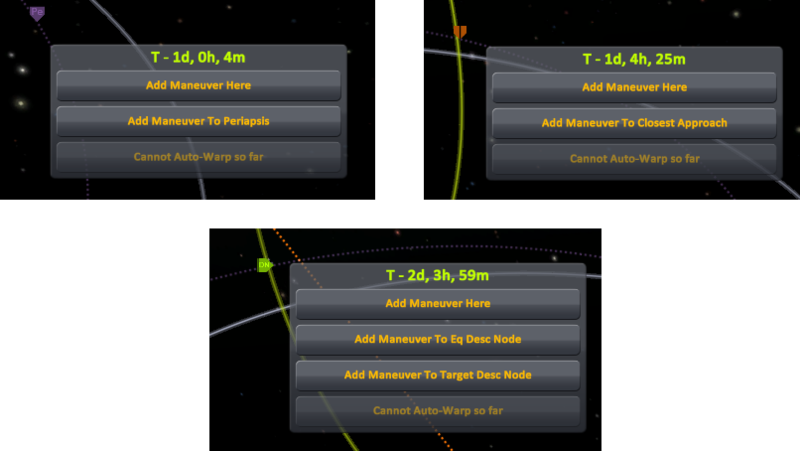 If you have two maneuver nodes, you can keep the windows open for both of them, even though only one maneuver node can be active at a time. When I download this, Windows Defender tells me that there is a trojan embedded in it.